Best practices in fluid handling and on site service for those who maintain off-road machinery. Thunder Creek Equipment, the leading manufacturer of fuel, service and maintenance trailers for farming operations, has announced the launch of its 2019 Premier Dealer Network. The national network features 13 high-performing dealerships, out of more than 125 total Thunder Creek dealers, from across the United States that are the first to be included in the exclusive program. Thunder Creek has made a series of detailed improvements to its Multi-Tank Trailer (MTT) fuel and service platform that allows users to legally haul up to 920 gallons of diesel without a CDL or HAZMAT endorsement [Title 49 (CFR49)]. The MTT updates are highlighted by a new electric manifold that automatically shuts off tank valves after fueling to ensure legal transportation and provide protection against users accidentally leaving a valve open, which could subject them to moving violations. Thunder Creek has made a series of improvements to its Fuel and Service (FST) Series Trailers, which haul 500-, 750- or 990-gallons of diesel, and feature an optional 100-gallon Diesel Exhaust Fluid (DEF) tank and customizable rear utility box. Ring Power Corporation and Thunder Creek Equipment have reached an agreement that will make the heavy equipment dealer an official distributor of Thunder Creek’s products for the construction industry in 44 counties throughout north and central Florida. Ring Power will sell and service the full line of fuel handling, fluid (DEF) and service products, including its Multi-tank Trailers (MTT) and Service and Lube Trailers (SLT). 02.15.18 | Yancey Bros. Co.
Yancey Bros. Co. and Thunder Creek Equipment have reached an agreement that will make the heavy equipment dealer an official provider of Thunder Creek’s products throughout Georgia. Yancey Bros. Co. will sell and service the full line of Thunder Creek fuel, diesel exhaust fluid (DEF) and service products, including its line of Multi-Tank Trailers (MTT) and Service and Lube Trailers (SLT). AgriVision Solutions has signed on with Thunder Creek Equipment to carry the company’s line of Fuel & Service Trailers (FST) at its Salisbury, Missouri operation. AgriVision is an independent agronomy consulting business specializing in Missouri row crops. Thunder Creek Equipment introduces the industry’s first combination diesel and diesel exhaust fluid (DEF) transfer tank for pickup trucks. This exclusive combo tank provides 100 gallons of diesel and 18 gallons of DEF capacity that fits seamlessly into the bed of pickup trucks (half-ton and larger – including goosenecks and fifth wheels) with both pumping systems concealed within its structure – no elements protrude from the tank. The sleek design ensures excellent rear visibility by taking up no more than half of the rear window. 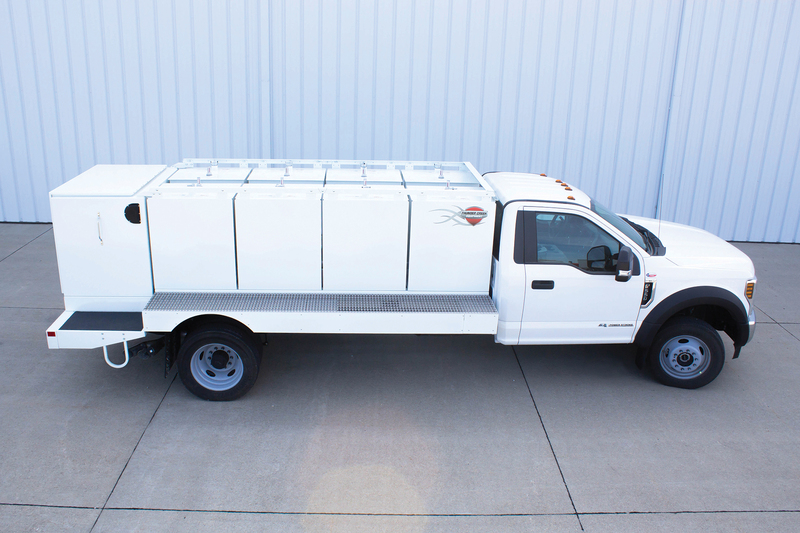 Introducing the all-new DEF Saddle Tank—an industrial-grade, ISO-compliant portable DEF system designed to be mounted to the frame rails of a truck chassis. Available in both 60- and 120-gallon capacities, the stainless steel DEF tank features a lockable, weather-sealed enclosure, a 12V sending unit with gauge, a locking fill cap and a skid base for mounting to the frame rails of a truck. Thunder Creek Equipment‘s all-new Multi-Tank Trailers (MTT) are the first fuel and service trailers designed to legally transport bulk diesel on the road without requiring drivers to maintain a CDL or HAZMAT endorsement. Thunder Creek Debuts New 1,200-gallon Bulk DEF Tank for Retail and Fleet Applications. Thunder Creek Equipment introduces its all-new 1,200-gallon bulk Diesel Exhaust Fluid (DEF) tank, a turnkey system designed for use in both retail and large fleet operations, including on-road trucking and off-road construction. Over the past few years, refilling with Diesel Exhaust Fluid has become a part of regular maintenance on equipment that is 75hp and above. Depending on what machines you run, you may need to refill DEF as frequently as every time you fuel. The challenge is that DEF is different than most fluids we’re used to handling around the farm. Here’s what you need to know. Thunder Creek Equipment introduces new FST Series Trailers available in 500-, 750- and 990-gallon diesel capacities with a host of field installable options like a 100-gallon DEF delivery system and rear utility box. 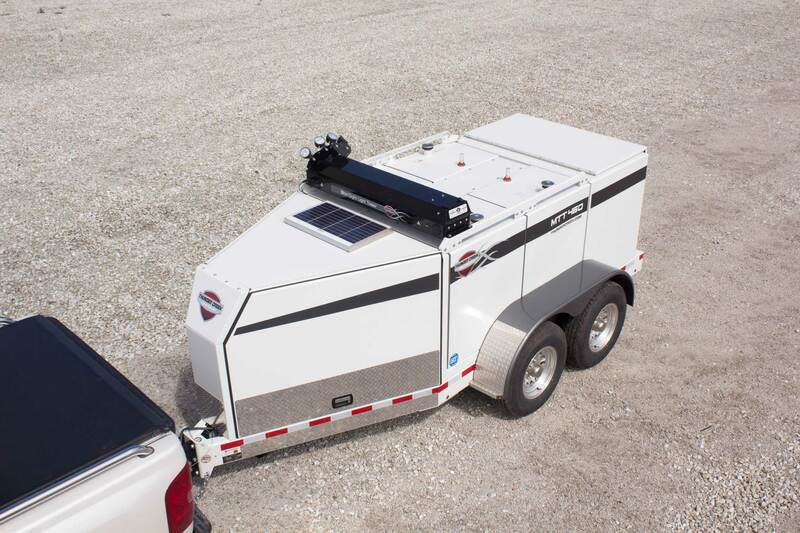 Thunder Creek Equipment, a leading manufacturer of fuel and service trailers, has expanded their product line with the introduction of a new trailer designed specifically for in-field equipment service. Thunder Creek Equipment, a leading manufacturer of fuel and service trailers, has developed a double wall fuel tank and trailer combination that is compliant with the EPA’s SPCC Program as well as DOT406 and Transport Canada regulations. 2014 introduces the final Tier 4 emission standards. The solutions from all manufacturers of high horsepower diesel engines will include the use of Diesel Exhaust Fluid. With that comes challenges, notably the need for a clean and convenient way to get DEF to machinery in off-road applications. 3-in-1 Air N Arc 190 Combines Generator, Compressor and Welder.